Recently Chicagoland church planter Dave Andreson was addressing a group of mostly college students on the subject of how to pray for your community. I was there primarily because our son Noah was hosting the meeting at his church, Calvary Baptist in Elgin. I winced with conviction at the truth of Dave’s observation, and not just for college students. Sadly, I’ve known people who seem to have the mindset that their situation is temporary, and as a result they seem to be just biding their time spiritually. “Oh we just came here for Bill’s job, but we’ll be going back home eventually,” they sometimes say. And yet when asked how long they’ve lived there, the answer is often twenty or thirty years. Or, “When our kids are older and life slows down some, we may have more time to do missions or help with outreach.” Especially in today’s ever-changing and mobile society, we cannot wait until our situations are more “permanent” to take ownership of our communities. That day may never come. Dave went on to speak of the passion that Jesus had for a city, and for a crowd, and for a man named Zacchaeus. He urged us to be like Jesus and see our city, and our crowds, and the God-created individuals around us with spiritual eyes. And he invited us to pray with him for Avondale, the Chicago neighborhood that he has now made his home, and where he is seeking to plant a new church. Avondale is a community of only two square miles, yet 40,000 people live there. It has no Baptist church, and little if any evangelical witness. Dave challenged us all that night to take ownership of our communities, wherever we find ourselves, and to do it now. We can’t wait for more permanent or ideal circumstances. People need prayer, and relationship, and the Gospel message. His challenge reminded me of a time that our family ate at a fast food restaurant, when our boys were still little. Though the employees were working hard, the dinner rush had overwhelmed them and more than half of the tables were a mess while the trashcans overflowed. So as we left, I asked our boys to help me clear the rest of the tables in the restaurant, in addition to our own. “But Dad, we don’t work here!” one of them cried. And yet because I asked them to, they helped me take responsibility for other people’s messes, there in our temporary community. As we enter another Christmas season and begin reflecting on the birth of Christ, let us remember that Jesus willingly entered our world and made it His home. 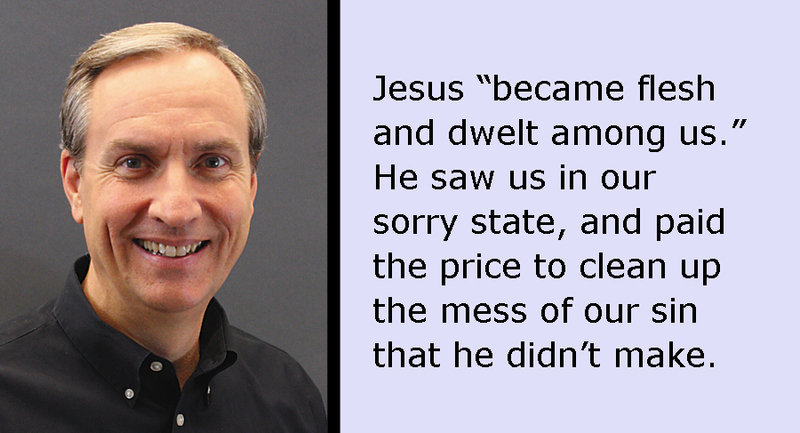 He “became flesh and dwelt among us.” He saw us in our sorry state, and paid the price to clean up the mess of our sin that he didn’t make. So let’s enter in and spiritually invest in our own communities, even now. Let’s take ownership of where we live, even if it doesn’t feel permanent, or even if it’s in a difficult place like the Avondale neighborhood of Chicago. Our community, wherever it is, is our mission field. Home is here, and the time is now.